On August 14, the VDP issued a press release announcing that there will be new wine-labeling regulations in the state of Rhineland-Palatinate (Rheinland-Pfalz), which includes the wine regions of the Ahr, Mittelrhein, Mosel, Nahe, Rheinhessen, and Pfalz. This had been brought to my attention by the wine critic David Schildknecht. The VDP welcomes the new measures as supportive of its recent mantra: "The narrower the designation of origin on the label—the higher the quality." The new wine-labeling regulations in Rhineland-Palatinate require a higher must weight for wines from single vineyards, and the wines from terraced sites have to be either Riesling or Pinots. The most important new rule would enable the registration of pre-1971 sites that are officially listed on cadastral maps. "Surely, this is just a small first, but definitely a correct step in the right direction in order to highlight single vineyards as the authentic origin of top German wines," VDP President Steffen Christmann says. Above all, the VDP wants to make sure that the average consumer can differentiate an Einzellage (single vineyard) from a Grosslage (collective site) and considers the elimination of current Grosslage names as the next step essential to avoiding continued consumer confusion. In the press release, they use the example of the Grosslage Forster Schnepfenflug, which doesn't have the same quality criteria and is indistinguishable from the well-known Einzellage Forster Ungeheuer. Both are Pfalz wines from the Mittelhaardt, but the average consumer, it's argued, can't distinguish the two. To be clear, the new wine-labeling rules in Rhineland-Palatinate would be for non-VDP producers, too. This is not a VDP-only initiative, as with the controversial VDP classification model. Moreover, the application process for enabling the use of old place-names (lieux-dits in French) that were covered up by the 1971 German Wine Law is said to be a fairly easy and affordable process. This is much different from those, who, like Reinhard Löwenstein of Heymann-Löwentein, have been seeking a Protected Designation of Origin (PDO)—geschützte Ursprungsbezeichnung (g.U. )—for delimited areas. This is part of the new EU wine laws. In the case of Löwenstein, he and several other leading growers, including Knebel, with vines in Uhlen, would like to officially designate specific sections of the hillside that have clearly different soil types. The problem with registering a PDO is that few could afford the time and legal assistance attendant on such an appeal. It would then create an exclusive club of registered PDO sites that might or might not be old site names in the land survey register. "I've always been quite tolerant of very detailed origin names, and would rather deal with the problems they might present than keep dealing with the current situations," says Terry Theise, a leading American importer of fine German wines. "I think it would be helpful for someone like Stefan Justen [Meulenhof in Erden] to be able to distinguish between his old vines among the cliffs versus his young vines in the flurbereinigt [remodeled] parcels downstream by something other than lot/tank numbers, though all called '[Erdener] Treppchen.'" The trouble with the VDP's generalization "the narrower the geographical delimitation the better the wine" is not just that it's ambiguous and in its most obvious interpretation frequently false (a blend across sites might be better or enjoy greater prestige than a site-specific wine) but that when you try to resolve its ambiguity you realize that what purports to be a general principle ("Grundsatz" per VDP's press release) or observed regularity is really a disguised plea for limiting the geographical designations permissible for German wine, a winnowing-down to those deemed best that has been going on over the past decade within the VDP. The VDP's adage is their means of asserting that the consumer ought to be able or is entitled to conclude from the geographical specificity of the wine's name that it is superior. I think a statement like that made by the VDP regarding origin and quality is obtuse and tendentious, and I say that as someone who is basically in sympathy with the concept. It only can work—accent on only—in concert with a vineyard classification. Schildknecht and I part company on this question, and I find his reasoning, as always, thorough and compelling. And yet I still must demur. Specificity of origin can only possibly matter as long as some mechanism is in place to ensure we are describing vineyards known to produce exceptional wines. Even here, one must be careful. Simply to use a micro-parcel name, or an old single-site name the '71 wine law obliterated, could be misleading by suggesting the wine in the bottle will somehow be singular. To cite a single example, I would imagine that many of the cadaster names in a large single-site such as Forster Ungeheuer will give wines similar enough to one another that there's little point in distinguishing them. Yet of course the "Ziegler," lying close to Jesuitengarten, has stylistic elements leaning toward its near-neighbor and actually does taste different than many other Ungeheuers. But who are the guardians to be, and how shall they prove we can trust them? *An example of the latter category—also from the Saar—is Ockfener Zickelgarten. This Einzellage was last employed by von Kesselstatt in the early 1980s. After a legally stipulated period of disuse of its name on labels, the site was officially stricken from the list of Einzellagen and the surface area assigned to the (already bloated) Einzellage Ockfener Bockstein. The Weis family of St. Urbans-Hof held a significant part of the original Zickelgarten acreage and eventually began to play-up the distinctiveness of that location. But Nik Weis only became aware when David Schildknecht and Jean Fisch (Mosel Fine Wines) brought it to his attention that Zickelgarten was an official Einzellage well into the 1980s. The Weis family subsequently acquired the balance of this site with the intention of appealing to the authorities to have its status as an Einzellage reinstated, now as their monopole. The new regulations under discussion here render moot such a prolonged and bureaucratically arduous effort as would have been necessary to achieve a reinstatement. It must be noted, incidentally, that how strictly the prohibition on old site names is enforced, varies from one office to another of the Weinkontrolle and sometimes turns on a ludicrously arbitrary distinction that will be familiar to all US wine importers and distributors, namely what gets registered as a "front" and what as a "back" label. †This approach has proved good enough for the Côte d'Or—the VDP's avowed model in so many matters—where cadastre names are permitted for use even at the generic level and many a non-cru has claimed its rightful price thanks to consumers being permitted to recognize that wine from the site in question exhibits quality tendencies. Image courtesy of Florian Lauer. Wonderful article. Thanks much for taking the time to write it up. I look forward to the return of old names to preserve the culture and history of families that have been working these sites for generations. Thank you, Dan. I appreciate your comment. Fortunately, Terry Theise and David Schildknecht took the time to let me quote them for my write-up. I look forward to the use of old place-names, too. For those who might be wondering about the extensive footnote, David did write it for me. Besides, I didn’t even know that about Ockfener Zickelgarten. David Schildknecht just asked me to add a second footnote written by him. It’s the one with the dagger. Thank you for the great article, Lars, and thank you David for your additions. My biggest concern is the rule that the wines from terraced sites have to be Riesling or Pinots. It’s too bad that Scheurebe continues to get the silent treatment from the VDP when it’s certainly capable of making wines of the same quality as either of the white Pinots. You’re welcome. I was wondering about that point, too. What if a terraced vineyard has really old Müller-Thurgau or Elbling? But this will change in the 2014 vintage. Instead of naming Faß 17 “Neuenbersch,” Florian Lauer can now use the name of the place: Neuenberg. Historically a very significant article for the future, mixed good news. I totally agree with the point about Rielsing and Pinots. Here is an example. Although it doesn’t come from the Rheinland-Pfalz, I drank a lowly Mueller-Thurgau with the team at the State Domain of Wuerzburg in its famed cellars beneath the Residenz. It was a wine of great depth and subtlety. Since then I understand that also in places like the Alto Adige limiting yields and care in production also produces M-Ts of like profundity. Perhaps it’s the the misuse of this variety that has given it a reputation of mediocrity. Thanks for your reply, John. I’ve been tasting at different producers on the Middle Mosel and Saar with David Schildknecht over the last few days. In the meantime, I’m writing an addendum to this piece. On a visit to Weingut Günther Steinmetz, Stefan Steinmetz poured us an impressive Pinot Meunier. At first, we thought it was Pinot Noir. Stefan also makes a very good old-vine Müller-Thurgau, which we didn’t taste this time around. Over the last several days, I’ve visited a number of growers on the Saar and Middle Mosel and asked them about the new wine-labeling regulations. Most of them were skeptical. It’s important to note that many of the old named sites are not on the official cadastral maps and hence are not allowed. It depends on the village or commune. Moreover, the map makers didn’t always have it right, and the growers have more site-specific names for the different sections or parcels on a given hillside. In other words, the place-names on the cadastral maps are usually different from the colloquial parcel names used by the growers themselves. I will write more about this in my addendum to this article. 1. Maximal information to the consumer on geographic origins. 2. Markets, not officials or grower groups, should decide among sites for nomenclature and classification. 3. Sites should be reclassified every few years based on objective preselection criteria including usage and market perception of quality, by ballot among all growers in the region. Thus we have the two most important poles of interest represented: the market and the growers. A vineyard classification is a difficult undertaking, and so much depends on the winegrower and vintage. Many vineyard sites simply lack a quality-conscious grower. In addition, one site might perform better than another in a given year. We also have to factor in climate change, remodeling, (post-1971) redrawn borders, and so on and so forth. This was a great article, good news is always welcome. I’m just kicking around some ideas, nothing too serious. Are these site specific names similar to the ones on the 1868/90 maps? I don’t see how there could have been, but was there an effort in the early part of the 20th century to continue mapping the region? This wouldn’t work for all the vineyards (or most), but what about taking the sites that have a clear line of historically value and start from there. If the site is fallow or mismanaged put it on a watch list until it reaches its potential. Unless this was pretty much taken care of during the ’71 restructuring and my point is moot. I don’t see how a Burgundian model isn’t helpful here, Regional Level – Village Level – Site Specific Einzellage. The question of quality doesn’t factor. The consumer/critic/market will sort out quality. Is that what David Schildknecht is saying? Fascinating as always, I’ll keep an eye out for new maps on the horizon. Thanks for your comment, Matt. As I’ve tried to explain in my article—as well as in my ensuing comments and in the addendum—the old named sites on the Clotten map(s) don’t always correspond to the official names on the cadastral maps. See my article and comments on Scharzberg. I believe all the parcels have been mapped in detail over the years. As for ranking the sites, I just don’t know how it can be done properly. Who is to decide what’s first class in the Mosel region? A wine critic? As I’ve said before, I find it rather presumptuous. The VDP’s classification is problematic. There are too many great sites in the Mosel region that get ignored. Do you mean that a Burgundian model is or is not helpful in Germany or on the Mosel? Yes, David Schildknecht believes that the market will determine if a site is worth its price. But he also believes that each grower should have the right to use the proper historical place-name of his or her site on the label. Unfortunately, many of these names are not listed on the official cadastral maps and cannot be used again. Thanks for taking the time to clear that up for me, sometimes I don’t read as carefully as I ought. I mean to say that the Burgundian Model could be helpful on the Mosel. The problem would be ranking, so don’t do it. Which, as David Schildknecht seems to say, would add further confusion. Just my two cents, for what they’re worth. It’s a shame that there are sites that have a historical name but no official record of the site’s delineation. I can see where not having a clear record of a parcel name could lead to intentional misrepresentation/misspelling of a new parcel. You’re welcome. On the Mosel, the Burgundian model is being used by most VDP members (the exceptions being Egon Müller and J.J. Prüm) and a number of prominent non-members, such as Julian Haart, A.J. Adam, or Vollenweider. 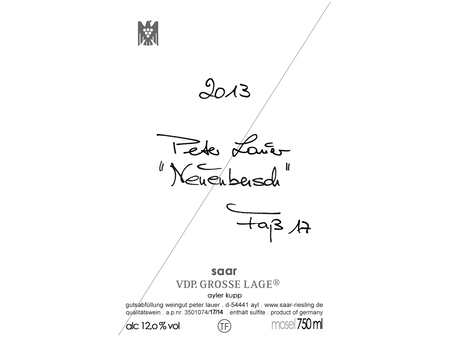 Though the VDP Mosel-Saar-Ruwer chose only to have Grosse Lage, rather than Grosse Lage and Erste Lage. In other words, it’s a three-tier hierarchy: a grand cru wine, a village wine, and a basic wine. In many cases, the village-level wine is coming from a Grosse Lage, or from sites that could be rated as such. I don’t believe David Schildknecht is a fan of a vineyard classification, much less the Burgundy model for German Riesling. There are different layers in talking about vineyards in Germany. The parcel names are usually colluquial, whereas the cadastral names (i.e., the names on the land register maps) consist of various parcels and are not necessarily used by the growers. In addition, the cadastral names don’t always apply to the named sites found on the old maps. I hope this makes some sense. It’s coming together. Especially nomenclature when speaking about vineyards in Germany. The three tier system has finally set in. Now that I re-read Mr. Schildknecht’s comments on vineyard classification, it’s clear he isn’t in favor of the project. Again thank you for your helping me get my bearings. Have a good weekend! It should be noted, too, that many place-names (lieux-dits in French) are not actually listed on the cadastral maps. After I became aware of the complications and limitations involved in vineyard-naming – partly in the course of conversations with Lars as our paths crossed in Germany over the past three weeks – I began asking growers whom I was visiting and whom it struck me might wish to make use of the liberties afforded by new legislation whether the cadaster names would suit their purposes. 1) The cadaster name is the same as the name that a grower or local growers uses to refer to a prime location that he or she would consider indicating on the label (or has somehow already managed to get past the Weinkontrolle). 2) The cadaster name is very close to though not identical to the name commonly used by the grower or local growers. Often the difference is merely the addition of a preposition and a definite article. 3) The cadaster name is similar but not close to that in common use or in use by the grower in question. An important question – which I have no time at present to explore and which will require considerable time and systematic inquiry – is the relative frequency of each of the above scenarios. Growers for whom 4) holds true will have little incentive to make use of the new legal liberties. And there is another complication insofar as the land area designated by a grower (or commonly by local growers) with a given name might not correspond with geographical precision to the surface area cadaster-registered under that name. But I harbor high hopes that this new loosening of the law can prove a boon to German wine growers as a whole. Given that vineyard names ought to apply unambiguously, the cadaster names offer an opportunity to specify sites with greater resolution than do the official Einzellagen (which familiarly suffer from other limitations as well). There is unlikely to be any political will to return to German site names as they existed in 1970 because the 1971 Einzellagen are simply too entrenched both as marketing tools and in consumers’ minds. But the new legislation envisions use of cadaster names solely in conjunction with the names of the official Einzellage, not a replacement or redefinition of the latter. An interesting question for which no grower with whom I met in recent weeks had an answer, is whether there will be stipulations regarding the relative font sizes or positioning of cadaster and Einzellage names on labels. Presumably such rule have yet to be written (or – let us hope! – not ;- ). If these matters are left to the grower’s discretion or at least relatively loose, then those who want to emphasize the benefit of Einzellage consumer-recognition as well as the specificity of the cadaster name might choose, say, to render “Ayler Kupp” and “Neuenberg” in direct conjunction and similar font size whereas someone else (or for that matter the same grower in referring to a different site) might want to render, say, “Schonfels” prominently as the name of the wine, with “Ayler Kupp” appearing in smaller print somewhere as a quasi appellation contrôlée. Thanks for spelling out the various options. It might be good to give some examples, as I did in our discussion under the article “Old Place-Names (Addendum),” which, by the way, includes more insight into the issues about these new wine-labeling regulations and the VDP’s attempt to be more like grand cru Burgundy for its Grosse Lage—i.e., dropping the village designation on the front label, despite many vineyards (across German wine regions) having the same site name, such as Altenberg, Kupp, or Schlossberg. 1) (Ayler) Neuenberg or Schonfels (Ayler Kupp). 2) in der Sängerei (Dhroner Hofberg) or Auf der Schmitt (Zeltinger Schlossberg). 4) “Dem breiten Weinberg” (the common name within the cadastral site of Im Besten Scharzberg in Scharzhofberg). How could the wines be labeled? I don’t know for sure, but here’s an idea. 2) in der Sängerei (on the front label) and Dhroner Hofberg – in der Sängerei (on the back label). 3) Ayler Kupp – Stirn or Stirn (on the front label) and Ayler Kupp – Stirn (on the back label). 4) Scharzhofberger (Egon Müller doesn’t plan on using “Im Besten Scharzberg”). Let me reiterate point 3: In many cases, the cadastral place-names (Gewannnamen) are different from the named sites on old maps. It depends on the village or town. In addition, the growers tend to use common names for the different sections or parcels in their vineyards (also point 4). For example, Peter Lauer’s “Stirn” is not on the cadastral map of Ayl. It’s Im untersten Berg, but the the growers still say “Stirn” for this upper section of the hillside, above the area known as “Unterstenberg,” which, by the way, means the “foot of the hill.” In other words, “Unterstenberg” and “Stirn” are within the cadastral place-name, or Gewann, of Im untersten Berg. Unterstenberg and Stirn are core sections of Ayler Kupp, between Neu(en)berg and the ur-Kupp. See “Im untersten Berg” for more details. Thanks for providing a link to the Landwirtschaftskammer Rheinland-Pfalz website with the registered Gewannnamen. As you pointed out in an email, a Gewannname, an Einzellage, and a Grosslage all look the same, such as in your example: Forster Ziegler (Gewannname), Forster Ungeheuer (Einzellage), and Forster Mariengarten (Grosslage). An average consumer would be unclear which is which. Moreover, Ungeheuer is a VDP.Grosse Lage, which will confuse consumers who don’t know the difference between Grosslage and Grosse Lage. The potential confusion goes beyond just the common formula by which Grosslagen, Einzellagen and now Gewannnamen would be inscribed on a label. NONE is nested within the one following! But it strikes me offhand that as welcome as I find the new regulation permitting use of cadaster place-names (a.k.a. Flurnamen a.k.a. Gewannnamen – and no, that last’s not misspelled ;- ), a requirement that these be subordinated on labels to the relevant Einzellage – as a sort of overarching appellation – would have been a way of avoiding confusion. Many growers will use this optional form anyway, as a means of having their cake and eating it too: deriving any benefit from its reputation and familiarity that accrues to the 1971 Einzellage while further identifying the wine’s source and implicitly pedigree. On the other hand – as I have already intimated – if the new regulations are not modified and it remains possible to register and then label wines solely according to the same formula (commune+site) that is used for Einzellagen, then the very notion of an official Einzellage will likely rapidly become an anachronism.